... Dansoman Hosts Thousands Of Tourists ... God had sent down his Son to Dansoman Shall we call it religious tourism? 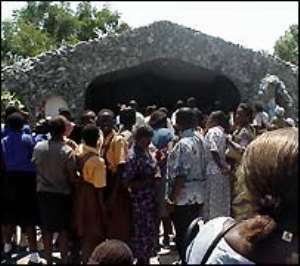 Ten clear days after an image of Jesus Christ appeared at the Margaret Mary Catholic Church place in Dansoman, Accra, many people continue to throng the grotto to see things for themselves. People from all walks of life, gender and lifestyles are still trooping in their dozens to have a look at the image which, it is said, was first sighted on Saturday, October 31. The crowd that gathers everyday at the site has begun to make the church premises look more and more like a tourist site. Apparently, the queue that forms there from morning till late is a daily affair and the crowd is usually made up of believers, sceptics and simply curious passers-by. During my visit to the grotto last Thursday, I could not see the image easily especially as I had no idea where to look. Immediately it was pointed out to me, the outline of a human head came into focus and then the eyes, nose and a crown of thorns appeared well outlined. Some people claim that the first time the image appeared, there was a bright light around it. Others also claim that the image of Mary, Mother of Jesus, can be seen if a photograph of the image is held up to the light. Everybody appears to have a personal opinion about one thing or the other including the authenticity of the image and its power to perform miracles. Asked if they believed that the image was real, a majority of the people I spoke to said yes. A young woman in her twenties told me the image was real but it was put there to divert the focus of Catholics from the statue of Mary, Mother of God, they pray to. She said that God had sent the image to Catholics all around the world to see that Mary is not as important as Jesus, the Son of God. Another man who had been returning to the grotto daily since the day the image was said to have appeared, believes the image is a testimony from God that the end times are here and the people who do believe in God should repent and get ready for His triumphant entry into the world, which he says would be very soon. He said “ The Bible says, He was going to come like a thief in the night and already they say the image was here before morning. It is a warning from God... we must be careful.” An elderly man who said he was simply curious and wanted to see for himself if what was being said was the truth said the image could be real but he was sceptical about its source. “ I strongly don't believe its a holy thing out there.” He said the image could be a way used by some dark forces to divert focus on serving God and that was why it appeared at the Catholic church. Asked his opinion about the image appearing nowhere but Dansoman, he said that it was roaming around the world and maybe this time, it was Dansoman's turn. Jessica, a young tourist from England and Grace, her Ghanaian counterpart, who came to queue for a chance to see the image of Christ said she was merely curious and believes the image has appeared in Dansoman because it could be that the people in Ghana believe more in God than others do in other parts of the world. Grace on the other hand said she had mixed feelings about the image and could really not say much about its genuineness.For one young woman, just the fact that the image had appeared was enough for her to believe in it. “The mere fact that the image is there makes me believe it really is a holy sign from God.” The former student of the Margaret Mary Secondary School said she needed no other signs or reasons to believe that God had sent down his Son to Dansoman and that there have been other such appearances all around the world so why not Dansoman. Even after all these days, when people have visited from all around the country, the numbers have not decreased. Indeed, instead of individuals streaming in, these days, whole busloads of religious tourists have been arriving at Dansoman to see the image of Christ.